Allegro Dancers Attending Canada’s National Ballet School! Congratulations to Allegro D ancers Farryn Klakurka, Paige Britton, Brielle Devin and Mara Wittick! 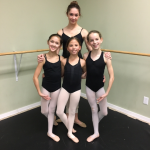 These four talented young ladies have been accepted into Canada’s National Ballet School Summer program and will be attending the month long intensive in July (which is also the second phase of the audition process). We are so proud to know that all of you will be representing Allegro School of Dance and we hope that you enjoy this amazing opportunity!